Police released very few details after an adult moped rider died in a crash near the intersection of Martin Luther King Jr. and 94th Avenue. They did indicate that there was a collision between a moped and a car, and that the driver remained at the scene. What Causes Florida Motorcycle Crashes? TBFTL, an abbreviation for “turned but failed to look,” appears on many motorcycle crash police reports in and around Tampa. Seeing these letters on an accident report is almost like seeing KIA (“killed in action”) on a battlefield casualty report. About a third of these crashes occur when the tortfeasor (negligent driver) makes a lane change or a left turn against traffic and moves directly into the path of an oncoming motorcycle. Most of the Florida motorcycle riders who have gone down probably heard the tortfeasor tell the officer that the rider “came out of nowhere.” That’s simply not true. The rider was generally there all along but the tortfeasor was simply not maintaining a proper lookout. 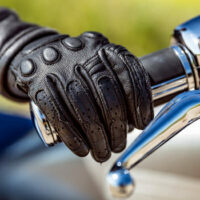 Many vehicle drivers resent motorcycle riders and therefore do not keep much of a watch. This motorcycle prejudice is discussed in detail below. Speed is a factor in many serious injury motorcycle-vehicle crashes as well, because it increases the risk of a collision and also makes the injuries more severe. Speed multiplies stopping distance. For example, a car travelling 30mph can safely stop after travelling about six car lengths, but stopping distance triples to eighteen car lengths at 60mph. If, as is often the case, the tortfeasor only saw the rider at the last moment, a collision is basically inevitable. Head Injuries: These wounds are common even if the victim is wearing a helmet. Just like a person can scramble an egg in the shell just by shaking it, a sudden, jarring movement is sufficient to cause a head injury. Road Burns: Although normally not life-threatening, these large and painful abrasions sharply limit mobility, sometimes for weeks or months. Furthermore, time is basically the only possible cure. Broken Bones: The force of the impact throws most riders off their bikes, resulting in severe broken bones which often require metal pins to set and extensive physical rehabilitation to heal properly. Motorcycle riders are almost thirty times more likely to die in an accident than vehicle occupants, a statistic which sums up the dangers that these riders face. The motorcycle prejudice is not as strong in moped cases, since such riders rarely travel in groups, do not operate at high speeds, and usually cannot weave in and out of traffic. However, it’s still there, and an attorney must deal with it. An experienced trial lawyer who has picked several juries in his or her career will be able eliminate those potential jurors who will not be able to evaluate the merits of the plaintiff’s case because of deep rooted prejudices and biases. Motorcycle-vehicle crashes almost always cause serious injuries. For a free consultation with an experienced personal injury attorney in Tampa, contact The Matassini Law Firm, P.A. Home and hospital visits are available.